The incredible show of nature now accessible to all! 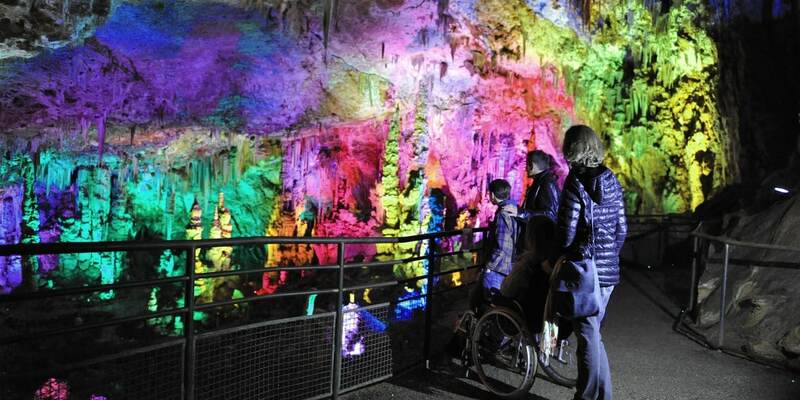 The Belvedere is a large terrace inside the cave, accessible from the disabled parking area in a wheelchair without assistance. It allows those who are unable to take the stairs to the guided tour to discover the main chamber of the cave from an indoor terrace offering breathtaking views. Free access to the person accompanying the disabled. The Belvedere is a non guided discovery of the Grotte de la Salamandre. Do not hesitate, book online with secure payment. Show up at the selected time with your ticket printed or displayed on your smartphone screen. Wheelchair accessibility is a technical feat that required connecting the outdoor terrace with the belvedere by a perfectly horizontal tunnel. This achievement is unique in Europe. The Grotte de la Salamandre, because of its surprising dimensions, can be accessed by those who normally fear confined places. Bring warm clothing (temperature 12°C).